Several Fairgrieve Elementary School students were recently named most improved for the month of December because they made academic and/or behavioral strides. 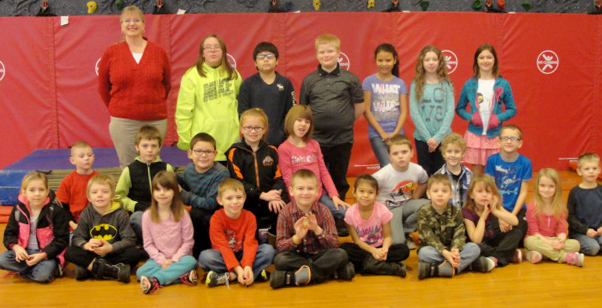 Fairgrieve Principal Jean Sampsell stands proudly among the school’s Most Improved students for the month of December. For their efforts, they received accolades during a Morning Express program. Sitting from left are: Skye Thompson, Joseph Foley, Jamie Chappell, Elijah Howell, Matthew Tice, Rose Douglas, Jacob Clark, Gemma Calkins, Kyleigh Pearson and Francis Davis. Kneeling from left are: Aaron Doran, Gage Brown, Gabe Taylor, Karina Santana, Bianna Vandelinder, Micah Collins, Lloyd Pierce and Joseph Sellin. Standing from left are: Principal Jean Sampsell and students: LeAnn Lewis, Benjamin Clements, Logan Spoon, Dominique Bentley, Ashlyn Bonnell and Morgan Scaringi. Absent are Lilyana Hall and Emily Barrett.